Have you developed a coherent social media style? If so, do you have a guide that helps you follow it? Do you have a consistent brand message on social media? These two things go hand-in-hand and are essential for showcasing your brand exactly how you want to display it. With the help of a coherent social media style and e, you make it clear to everyone in your team (including yourself) how you should act on social media. In this article, we’re digging deeper in how having a coherent social media style and brand message will let you share better content, give your customers better responses, and help you gain overall better results from your efforts social media. Getting better results isn’t always about working harder. Often times, it’s about streamlining what you are already doing. A coherent social media style and brand message, go hand-in-hand, as mentioned, and for the simplicity of it, let’s call it social style. A social style is a map and guide to how you should act on social media. Whenever someone feels insecure about how to manage your social media, they should be able to take a quick glance at your social style guide and know what to do. By having a social style guide in place, you can create a more coherent style across all your social platforms that really reflects you as a brand and the message you want to convey. What this means more concretely is everything that distinguishes your brand on social media such as video content, photo content, colors, shapes, and writing style. When you have this in place, you’re not only making it easier for you to know what to post and what to post it. You’re also making sure that everyone who manages your social media all share content that aligns with your social style guide. Manage your social in the right way. The more people you have working on your social, the more the posts tend to vary between each other, and considering the fact that a consistent brand message is so important, a social style guide isn’t something you want to neglect. No matter if your social accounts are managed by 1 or 20 people, it should look like all posts have been shared by the same person. If every single post of yours, or every single response to one of your customers look differently, your audience will get confused in what type of brand you really are, and they won’t see your brand as a personality. Every day, you change your style when you go to work. One day, you have a suit and act like a gentleman. The next day, you have hip-hop clothes and bump Ice Cube in a big stereo. Another day, you’re casual just like everyone else in your office. People will be immensely confused and never know what your true personality really is. They will have a hard time to get to know you, simply put. And the same goes for social media. Why do you really need a social style guide? First of all, you need it to make sure everyone in your team is pulling in the same direction. If everyone pulls in different directions, and the goals aren’t aligned, it will be difficult to reach any goal at all. Secondly, it can help you avoid social media disasters. Social media mistakes are usually committed by individuals, and when everyone knows exactly what is OK and what is not, the chances of committing a mistake decreases. Lastly, a social style guide makes it easier for new people to hop in and work with your brand’s social media. A quick read-through will tell them a lot about how they should present your brand, thus making the introduction time much shorter. Now that we got that sorted, let’s dig into social media style guides and how you create one yourself. First of all, you need to decide how you want to display your brand. This is the foundation to creating one. You probably have an idea in your head of how you want people to see your brand, and what they should think of when they see it. Of course, this has a lot to do with your target audience. If you’re trying to reach millennials, you obviously don’t want to present your brand as old and boring, but fun and exciting. There are many parts of creating a social style guide and road map, so let’s take a quick look at them and then break them down in more detail. The foundation to a social presence is your profile. When setting up your profile, you want to put great thought into how you want it to present your brand. Be appealing and interesting enough for your audience to continue looking at your profile, posts, and hopefully also your website. Send out your brand message on how you want to present your brand, and how you want other people to remember it. Do you want people to remember it as boring or fun? There are many parts that go into creating an amazing social profile. But for now, we’ll just cover the basics. If you want to learn how to create an amazing bio in Twitter or Instagram, you can read the suggested articles below. First, there is your profile picture. As a brand, you always want to opt for using your logo as your profile picture – across all social channels because this helps you make your accounts instantly recognizable, while also increasing brand and logo recognition. Secondly, we have your bio. This is the short description in your profile that is used to describe what your brand is all about. Many brands take the opportunity to add a little bit of personality and flair in their bios. As it is one of the first things visitors will see when visiting their profile, it lets them understand the brand’s personality right at the front door. 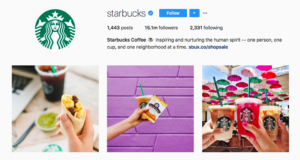 Starbucks presents “their mission” in their bio as a subtle and engaging way of saying “are you in?”. This brings us to the next point: username. The recommended is always to use the same username across all your social channels – but that’s only for your “official” account. There are also other scenarios where you don’t want to have the exact same username on all your accounts. For example when creating a customer care account, or an account dedicated to a particular country. (More on that further on). The reason your brand name is the best choice for a username is that people tend to search for it when they are looking for you. But what do you do when your username is taken? Sometimes, it is possible to get in touch with the owner of the username and ask them to hand it over in exchange for a payment. However, as they are the ones with the leverage, they often tend to charge quite a bit for usernames. Especially if it’s a brand who looks like it can pay. Okay, I mentioned that having your brand name isn’t always the best choice, and that is completely true. 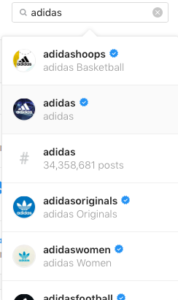 A quick search for “Adidas” in Instagram gave me 39 results of accounts that were verified. Now, chances are that you won’t create 39+ accounts on one single platform, but it just goes to show that creating different accounts (with different usernames) dedicated to different things makes it easier for your customers to find exactly what they are looking for. 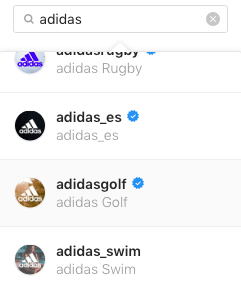 The natural choice for people who are interested in Adidas’s golf gear would most reasonably tap the account “AdidasGolf”. And Spanish Adidas fans would most likely choose “Adidas_es” to see posts written in Spanish. These things are important to think about when looking to create social media accounts. If your brand name is very generic such as “Cameragear”, chances are it will already be taken on most of the platforms you look at, and having a plan on what variants of your username you can use will be helpful. Apart from visual content, the language you write in is the most important part of how you present your brand, and how your audience perceives your brand. If you have 10 different people who work with your social media and all of them shares one post each, chances are, there will be 10 captions that present a different personality. At least if you are without a social style strategy. For your audience, having 10 different personalities isn’t something that is to strive for, so, therefore, it’s important that you decide on a personality and stick to it – in text as well as in visual content. There are endless opportunities on different languages and tones you can use, and once again, this depends a lot on your target audience. And many more of course. Only you can decide which of these are suitable to pursue in the language you use. The language you use also includes grammar and spelling. Just because you want to be “hip”, doesn’t mean you should misspell a word on purpose. In fact, you should never misspell a word on purpose. Heck, you shouldn’t even commit spelling errors. Just make sure you proofread everything that you post and ask other people in your team to read it as well. This will also help you know if the language you use in your text aligns with the social style guide you’ve set up. Also, and this is very important, never use slang, jargon, or abbreviations just because your target audience uses it. In fact, a study from SproutSocial found that 38,4% of people think that it’s annoying when brands use slang or jargon. And this is very interesting. People think it is most annoying when brands use slang and jargon that is obviously not the brand’s true identity. When brands use this type of language, people will instantly be able to see through it, and it might end up backlashing on you. The bottom line is: If you don’t know what a word means and have to look up its meaning, don’t use it. Hashtags and emojis should or shouldn’t be a part of your language. This also depends on how you want to present your brand. Hashtags can be used in social media conversations -but usually, they’re either used for promotions or to increase the reach. In fact, both hashtags and emojis have shown to be highly effective in social media marketing. Hashtags are not equally powerful across all social platforms, and should therefore not be used equally. 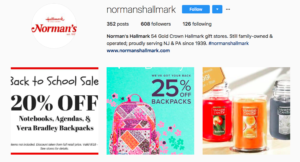 On Instagram and Twitter, for example, they are an essential tool that helps you read a wider audience, and people who might be interested in your brand. On Facebook, on the other hand, hashtags are essentially useless in terms of increasing reach. The only reason to use them there would be to empower the message you are trying to convey. As a brand, using a personalized or branded hashtag can be really fruitful and gain you a ton of exposure. 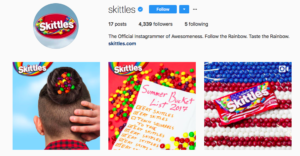 Read How to create a personalized hashtag and why you should, to learn the true power of personalized hashtags, because let me tell you: there are quite a few benefits of using them. However: whatever you do, never write your caption word-by-word in hashtags. 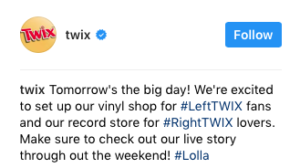 I’ve seen brands do this and this is a recipe for disaster. If you write the sentence “Click the link in our bio” in hashtags, it will look like this “#Click “the #link #in #our #bio”. When people see that, they’ll tune out immediately because it looks like spam. Secondly, these hashtags will not help you one bit in terms of reach. Nobody searches for the hashtags “Click” or “In”. If you want your brand to be seen as playful, young, and trendy, emojis are a great way to do that. 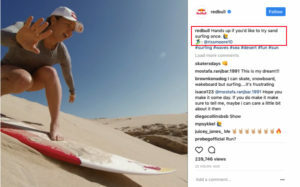 Emojis are not only used by the younger generation anymore, so even if you are targeting people who are older than millennials, you might be able to pull them off. Again, this depends on what personality you want your brand to have. They’re a brand that has built their personality around being sporty, trendy, and fun. Also, that’s the kind of people they are targeting. Therefore, their audience resonates well with the message they convey. Related: Can you use emojis in social media marketing? If you are going to use hashtags, make sure you use them moderately. If you bombard your caption with 10 emojis, people will wonder what is going on and might even shy away from you because it makes you seem desperate. Having posting templates may or may not be a good idea for you. What posting templates essentially are is a way to structure your social media posts. 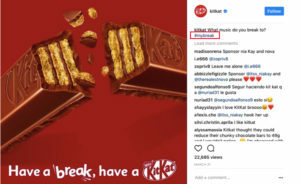 Some brands use the same template in all their social posts. They just change the content in it. For some brands, starting all their tweets, in the same way, might be a good strategy. For others, sharing a link and nothing else might be a strategy, and for some brands, writing a long story to help give your post content might be a good idea. Again, knowing what is “you” and what are do’s and don’ts will help you and your team know exactly what you can post, and what you might shy away from because it doesn’t align with your brand message. First, they write who the photo is from. Then, they share a story about that shot and gives it more context. Lastly, they end their post with a few relevant hashtags. Social media is an important customer service tool, and if you don’t believe me, I have the statistics to back it up. 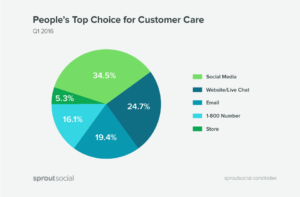 A study by SproutSocial found that 34,5% of people prefer social media for customer care. If you aren’t yet using social media for customer service, you better start today, because your customer demands it from you. 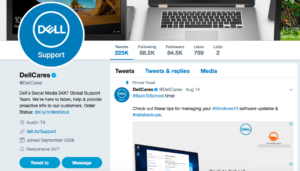 Many of the major brands have even created particular account on social media just for customer service, including Dell. What your social style guide will tell you is how you are going to respond your customers. 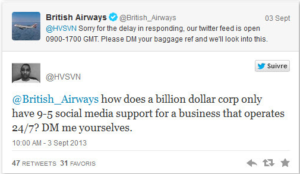 How are you responding to your customers on social media? Are you offering to help out as quickly as possible, or are you responding to your customers with “Thank you for your message, we’ll pass it on”? If you respond in a way that resonates well with your audience, you might be able to convert an angry customer into someone who enjoys your brand and your personality. You don’t need to share exactly the same content across all your social media channels, because, well, what’s the reason of following you on more than one? However, what you do need to have is a consistent-styled visual content sharing. 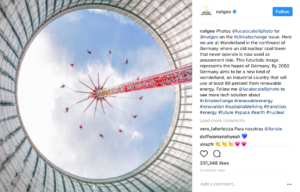 You can read a full-on guide to creating appealing and coherent visual content on social media here because if I would try to cover it here, we’d be here all day. Social media, in general, is visually driven. That means you need to have amazing visuals in order to reach any success on the platforms you are using. You also need to have a consistent social media strategy. What this means is that no matter where your audience comes across your posts, they should quickly be able to distinguish that it is your photo based on its style. 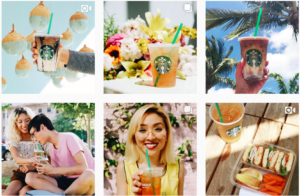 Many brands use different methods of creating content that is coherent, but of the top brands using Instagram, 60% use the same filter for all content. That says something about the importance of filters and how it helps your content stay more connected. By using the same filter, you’re not only creating a cohesion in your feed but you also evoke a mood or feel for your posts. What feelings do you want to give to your visitors? Your answer should be aligned with what personality you want your brand to have. If you want to be seen as a playful and fun, colors should be something you should take into consideration, for example. Their visual content is bright and contains a lot of fun and bright colors. 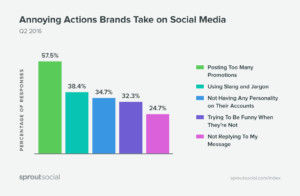 Having a social style strategy is essential in order to keep your brand message perfectly aligned at all times and to make sure everyone is following them. By having a social style strategy, you’re not only streamlining your social media work, you’re also creating and sharing content that presents your brand just how you like people to see it – and improve your brand message to better suit your audience’s preferences.